One night last week, I lay awake in bed, my eyes heavy with sleepiness bordering on pain. Insomnia is not an infliction of mine. I love to sleep, and I am good at it, thank you. But that night it was impossible: There was thunder, close, loud and frequent. It lasted for hours. It was beautiful, and strange, because I live in New Mexico and it is May, a month that could have marked the start of a nasty fire season but instead brought cloud cover and rain for days. Rain after rain after rain. Much of Colorado has been getting similarly soaked. "Last I checked we lived in a high mountain desert not a temperate rainforest," a friend of mine on the Western Slope quipped on Instagram, under a photo of two Adirondack chairs swallowed by grass higher than their arms. Here in New Mexico, people are getting grumpy. "I just want it to be sunny and 80 degrees," an acquaintance griped recently as we stood near a deserted music stage at a festival, our hoods up and getting drizzled upon. With another storm approaching just days after the night of thunder, my local All Things Considered host warned of "nasty weather" all over the listening area. Such words. Lest the residents of sunshine states forget: This rain, we needed it, even if California needed it just a bit more. It may save us yet from a June spent choking on smoke. 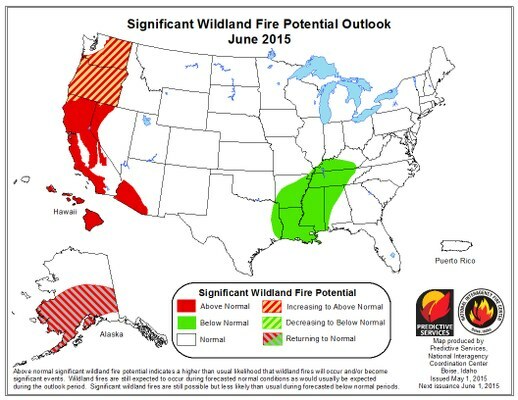 For now, the wildfire risk in much of the Intermountain West is not above normal, though that may change in July and August in the Northern Rockies, when wildfire season usually gets going there. 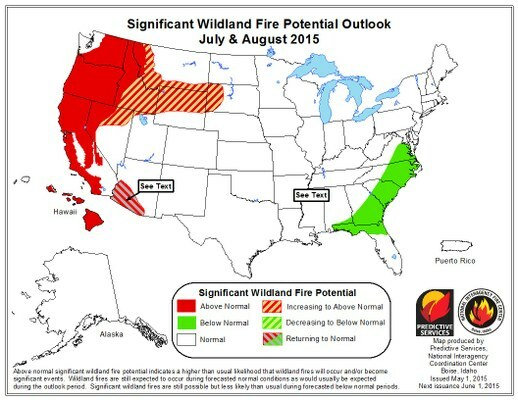 The rains won't save us from all of our drought-related ills, however. That still takes snow, and this winter was not generous with it throughout much of the West. Snowpack usually peaks in the region around April 1, but this year at that time, thanks to a balmy March and an unremarkable dusting, it was rapidly melting out. Nearly two months later, snowpacks look misleadingly good in parts of Colorado and New Mexico, where conditions for this time of year are above average thanks to late snow in the mountains at a time it would usually be waning. The new snow doesn't make up for its lack earlier in the year, nor the long, slow melt-out that would contribute to deep soil moisture. 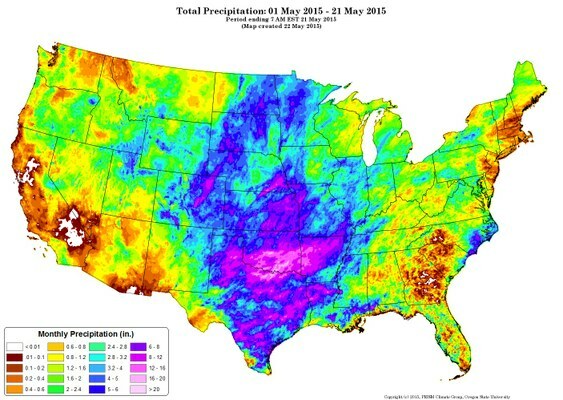 That said, the rains and snows of May have improved soil moisture at shallow depths. They've also been good for streamflows in some places, and beneficial for overall water supply, according to the Colorado River Basin Forecast Center, by reducing demand early in irrigation season. Streamflows nationwide. Texas has also benefited handsomely from recent rains. The expected inflow into major reservoirs is still expected to be low, however. Projections for inflow into Lake Powell from April to July remain at just 42 percent of average. And as we reported recently, Lake Mead has hit a record low. It's just three feet above the level which will trigger mandatory curtailments in Arizona and Nevada. Meanwhile, Elephant Butte, one of the major reservoirs on the Rio Grande, is only 20 percent full. So please, sun lovers, let us repent: Rain, rain, don't go away. Come again any ol' day. We didn't mean to call you nasty. Bring the thunder, morning, noon or night.